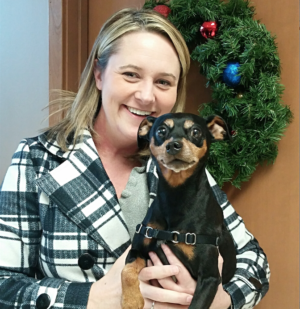 Griff is an adorable 7-year-old Miniature Pinscher that enjoyed a wonderful holiday season with his family. In November of 2015 Griff’s family noticed he was having some urinary problems. The family’s veterinarian tested him for a urinary tract infection; when the results came back negative they did further testing and found that Griff had a prostate tumor. A CT scan was performed, no other problems were noted and there was no evidence of lymph node involvement. After discussing treatment options, Griff’s family and veterinary team decided on stereotactic radiosurgery (SRS) to treat his prostate tumor. They chose this treatment option due to the precision dosing, need for fewer treatments (compared with standard radiation therapy), less side effects and a curative intent. In December of 2015 Griff received one SRS treatment. Yes, just one treatment. Due to the very precise dosing with SRS, Griff required only one treatment. Later that day Griff was ready to go home with his family and together they celebrated the holidays. Griff did great at his two-week check up and will have another follow-up visit with the Care Center Team in three months. Griff was treated at PetCure Oncology at Care Center in Cincinnati, Ohio.